FKI USA is a high volume custom metal stamping operation specializing in Class A high cosmetic decorative products as well as other complex stamped parts used in many markets including appliance, automotive, transportation, industrial, consumer electronics and more. Providing cost effective quality solutions to our customer’s challenges is our #1 objective. Parts are produced using brushed or polished stainless steel, pre-painted CRS, aluminum, or other high volume strength alloys. 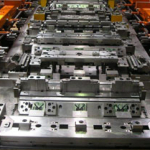 Our dynamic capabilities include progressive, deep draw and transfer stamping. 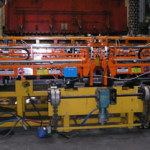 The 100,000 sq ft production facility is able to meet all your stamping needs with our onsite equipment with coils up to 60” OD and 20,000 lbs capacity as well as in-house mechanical presses from 200 to 600 Tons. Based in Dallas, Texas, we are able to serve our customers across the US and Mexico cost effectively. To complement our stamping capabilities, FKI USA is able to provide innovative custom designs to meet our customer demands including Class A Cosmetic Tooling (Progressive & Transfer Tooling Solutions). Our facility includes a full service precision tool and press room providing die design and maintenance of new and existing dies. With our in house die design and experienced tooling engineers, we can develop cost effective solutions to your challenges from very small to very large dies. Because of our other locations overseas, we are able to offer domestic and offshore manufacturing options and opportunities.